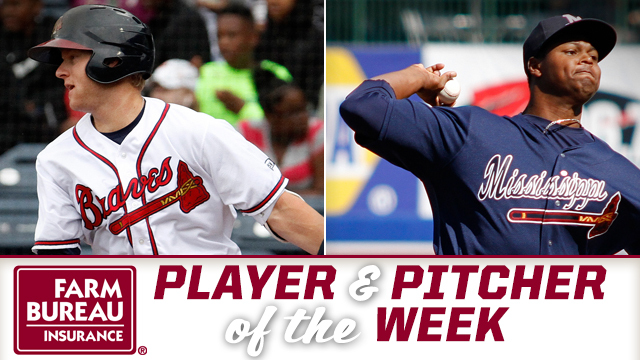 PEARL, MS -- Outfielder Dustin Peterson and RHP Mauricio Cabrera have been named Mississippi Farm Bureau Player and Pitcher of the Week for the week ending Sunday, June 12. Peterson, 21, posted a .385 batting average with two doubles, a homer and five RBI in six games during the week. He is hitting .266 with 15 doubles, a triple, six home runs and 33 RBI in 59 games with the Double-A Braves this season. The outfielder is hitting .333 against southpaws and was recently selected as a Southern League Mid-Season All-Star. Peterson entered the 2016 season ranked by Baseball America as the Braves No. 22 prospect. The Arizona native was acquired by the Braves as part of a six-player deal with San Diego that sent Justin Upton to the Padres in December 2014. Cabrera, 22, did not allow a run in three outings over the week. He gave up just one hit in five innings. On the season, Cabrera is 2-3 with four saves and a 3.45 ERA in 22 relief appearances. He's struck out 27 in 28.2 innings of work. He split last season between High-A Carolina and Double-A Mississippi where he combined to posted a 2-3 record with a save and a 5.59 ERA in 36 outings. A native of the Dominican Republic, Cabrera was signed by the Braves as a non-drafted free agent on July 2, 2010.